Some things you can't explain. Some things just are. I watched my first ever F1 race on TV when not yet seven years old, in the British Grand Prix of 1986. And while to this day I cannot rationalise it somehow during that hour and a half the bug bit. From that point on I was an obsessive. My recollection of the spell of childhood that followed that day was of rather standing apart from my school friends. For them it was soap operas (Neighbours, quickly buttressed by Home and Away), pop stars (Kylie and Jason, natch), football and, increasingly, computer games that took up much of their existences. While I wasn't too bad on the latter two subjects, all-in this wasn't for me. For me Formula One was the thing. My world would stop when a live race was on television, the highlights programmes would be recorded and watched repeatedly, copies of Autosport would be pored over. I often would incite glazed expressions among friends when I asked them if they'd watched a race over a weekend. Sometimes I would impress them but more likely would take the glazed expressions yet further with my ability to recite the entirety of an F1 grid - drivers, cars and engines, the whole season's calendar, to doodle circuit layouts, as well as quote sundry other details. But even with this as far as I was concerned there may as well have been only one guy out there - and his name was Ayrton Senna. Throughout much of my fervent following of the sport right up until the 1st of May 1994 - now almost exactly twenty years ago - I had eyes only for he. How I came to support Senna is now embarrassing in its mundanity as well as rather betrays the fickleness of youth. Initially I supported Nigel Mansell, as judging from Murray Walker's commentary of the said British Grand Prix of 1986 that was the done thing. And he won that day, which helped. I stuck with Mansell right through until the final round of that season - the round of Adelaide, an exploding tyre and all that. In my seven year-old head such failure on Mansell's part was inadmissible so smartly I switched my allegiance to the guy that won the title in Nigel's stead; Alain Prost. Prost then won the opening round of the 1987 campaign too, but then in round two at Imola for the San Marino Grand Prix Prost dropped out early, which snapped my delicate loyalty once more. I couldn't go back to supporting the guy that won, the self same Nigel Mansell, given he was one so recently rejected. So I went for the guy that finished second. Who just so happened to be Ayrton Senna. But there I stayed. And it's easy to understand why. Ayrton Senna da Silva captivated. It became apparent to me swiftly that there was something distinct - something highly out of the ordinary - about him. He was fast of course; aggressive; determined; skilled. That all goes without saying. But he was much more, and the fascination laid in most part that he did not seem at all like the rest of us; not as other racing drivers; not as other sportspeople. His intensity, his relentless, his willingness to do just about anything to win (as we were to see graphically) seemed not of this Earth. Whenever Senna drove an F1 car you felt that you were watching someone summon new levels of consciousness, able to discover new territories of mental and physical possibilities in his pursuit, areas that the rest of us couldn't possibly begin to comprehend. And Senna's presence out of the car seemed entirely in keeping with all of this; it was cyclical, reinforcing. Senna's charisma was extraordinary; understated yet undeniably powerful; his mystique tangible; his complexities fascinating. Alongside his extraordinary abilities he was deep, contemplative, never bombastic. In everything he did be it behind the wheel or not his air seemed to border on the ethereal. Senna had his flaws of course, again both with his behaviour out of the car and sometimes in. But at the time in the midst of my partisan mania I rejected such notions absolutely. I try to remind myself on the occasions these days that I witness those on the internet somehow managing to insist on a point that defies all evidence that had Twitter existed when I was 11 then it would have been me on there insisting until my fingers bled that Senna did nothing untoward at Suzuka in 1990... We can believe just about anything if we have the determination to. In time three world championships were won; many races were dominated. But then...along came Williams, first of all threatening in 1991, then in 1992 and 1993 enjoying a technical superiority that encroached the insulting, that not even Senna's extraordinary ability could overcome. Senna still was able to show his class, harrying the Grove cars heroically as well as seizing the scalp of race victory much more regularly than should have been his right. But even with this my sense of unfairness was acute - rather like the man himself I was not to be convinced of anything other than that it was Senna who was the one with the merited claim on the honours. Late in 1993, and after upwards of a year of trying, finally it was confirmed. Alain Prost was to retire; Senna was in at Williams for 1994. And the algorithm seemed undeniable: best driver; best car; best engine should add up to a season of demonstration runs. Many of course feared such a prospect, but Ayrton being on easy street suited me just fine. As we approached round three of the 1994 campaign - the round that we notoriously now mark the two-decade anniversary of - again at Imola for the San Marino Grand Prix, where it had began for me and Ayrton, such thoughts had however rather brusquely been chased from my consciousness. The San Marino Grand Prix and Imola had even in my still fairly brief existence for me become synonymous with spring in the full process of springing. It was the time of year when the sun would be a creeping presence, while the race also tended to mark the beginning of the European season as well as the first of my many Sunday afternoons of the campaign in front of the television watching a full race live (indeed, it often was the first live race full stop, the BBC at the time tending with only the odd exception to show just European rounds as they happened). Optimism for the year that yet stretched ahead invariably would be sharp. And Imola as a venue was highly apt for this; the popular and challenging track that undulated through lush and blossoming parkland, cheek by jowl with the charming town; picturesque in that inimitable Italian way. And the spring sunshine would enrich the greens of the park and the gentle reds and beiges of the local architecture. Then there were the tifosi that gathered in great number, just as passionate as those at Monza but somehow and thankfully shorn largely of the unpleasant edge that could manifest itself there. This race however, and even in this early stage of a season that was supposed to be a cruise, was one in which the pressure was on Ayrton. Things hadn't gone at all according to plan in the opening two rounds, him having finished neither. Worst of all, the Michael Schumacher/Benetton combination had against all expectations jumped clean over him and his Williams on pace. Senna's scarcely credible skills over a single lap ensured he was still bagging pole position, but come the race Schumi was not to be stopped. As the man himself had said in advance, for Senna the championship started here in Imola, with 14 rounds not 16. And add to this that Schumacher had a 20 point head start. For me - who didn't then have much of a grasp of technical rule changes (the banning of the technical 'gizmos' for this season had impeded Williams especially) - it was like normality had some been suspended. Just how could the car that had strolled to victory time after time over a 24 month period, and now combined with the best driver, suddenly be being beaten? Thus I approached this latest round at Imola with a mix of hope and trepidation. Hope that this would be the race wherein matters - from my perspective - would return to the script at last. Trepidation that it felt a lot like Ayrton Senna had to deliver this time. It was now or never. My first contact with the Grand Prix weekend was during the final qualifying session on the Saturday (qualifying then being split into two sessions). Then, the BBC generally didn't show qualifying sessions live (or at all), and with the internet age yet some years away finding out the starting grid tended to be a matter of hanging in wait for a line on a TV or radio sports news bulletin during Saturday afternoon. Eurosport - a subscription service at the time, and which I didn't have - did show it live however. And I recall being in town and spotting that some electrical shop or other was showing the proceedings live on one of the TVs in its front window. 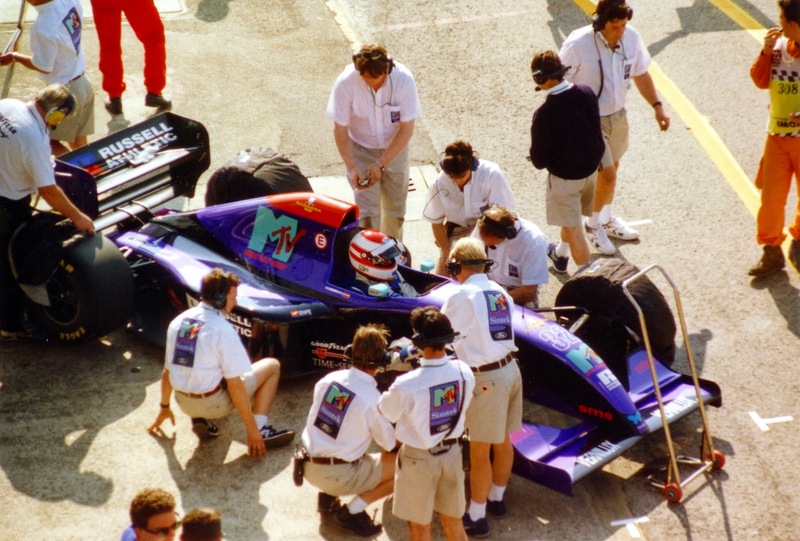 Unable to resist a peek, I looked just in time to see Roland Ratzenberger's Simtek come to rest at the distinctive Tosa corner after hitting a barrier at the Villeneuve sweep that preceded it. Having been beckoned away by my parents pretty much immediately so that we could continue on our way I didn't think a great deal more of it. After all, in F1 we'd grown so used to drivers hopping out of big smashes with barely a scratch. It had been eight years since anyone driving an F1 car had been killed in action; 12 since it had last happened in a Grand Prix weekend. I, like most associated with the sport, had grown desensitised and shamefully complacent, deluding themselves that F1 had discovered the answer when it came to safety; that we'd seen the end of the fatal crash (astonishing in hindsight, given how exposed in the cockpit the drivers of then look to the modern eye, and how perilous some of the fast turns with walls close of the time were). Sometime later that afternoon I was listening to the radio in my bedroom, in large part no doubt to get the qualifying outcome coming over the airwaves. But when the sport news headlines arrived it led not with the name of Senna, nor even with Schumacher. Roland Ratzenberger was the name that pierced from the speakers. Not only leading the F1 excerpt, but leading the sports news overall. Quickly it became apparent; Ratzenberger had perished in the accident I'd seen. I recall being disturbed by this. Of course, as one at the back of the pack with but one race behind him I had next-to no knowledge of, let alone any contact with, Roland Ratzenberger. But the sudden end of cosy certainties regarding F1 safety was unsettling. Like many, including plenty of those active within the sport, this was my first experience of death at an F1 race track. At the time too I had no idea of the profound impact the death had on Senna; my awareness of the conversation he had with Professor Sid Watkins - so often repeated now - laid some months in the future. What with Friday's running not really getting any coverage at all I also don't recall being especially aware of Rubens Barrichello's violent crash of the day before either, the incident that set in train the creeping sense of this being a weekend in hell. But still, the sense of trepidation had even got to me a little by the time that all cars lined up on the starting grid for the race's green light the following day. Its unmistakable sense that came across even in the TV coverage meant it could hardly not. And almost immediately when the green light did shine we received our latest additional impression that this was a weekend wherein it seemed just about everything would insist somehow on going horribly awry. JJ Lehto placed fifth on the grid - having himself sat out the first two rounds of the season with a neck injury sustained in testing - stalled as the race started and remained still and vulnerable as all others behind leapt from their starting slots and bore down on him. A never-ending it seemed succession of cars dodged by to the left and right. But just at the split second you thought that all might have made it through Pedro Lamy's Lotus, almost the last car by, hit the rear Lehto's Benetton at something close to full pelt, and the effect was rather like a bomb had gone off; shrapnel flying in all directions. Both drivers were unscathed thankfully, but it transpired later that some in the crowd where injured by debris. Given the carbon fibre that was scattered across the pit straight like confetti Murray Walker commentating was convinced that the race would be stopped, but instead the safety car was brought out. It was still a fairly new concept in the sport at the time, having been brought back in mid-1992 and not used much in the intervening period. For a number of laps as the mess was cleared all circulated at reduced speed (and to the modern eye much reduced speed). And it served to heighten the suspense; the tension, the longing for the whole thing just to calm down and run as normal, was allowed to boil up a little bit further. Eventually the safety car bottling up matters was unplugged as it pulled back into the pits, and the pack - Senna and Schumacher respectively in first and second especially it seemed - ran off like cheetahs released from a cage. Somehow for me it was after the safety car pulled in that I suddenly became conscious of the speed of Senna's Williams and of Schumacher's Benetton in close pursuit, the pair appearing like an animal after its prey. It all seemed to me extremely insecure; perilous. It wasn't any sort of premonition - more likely it was related to the night-and-day distinction with the slow pace behind the safety car combined with the fact that Gerhard Berger in third was rather caught on the hop and left far behind, as well as all coloured by the general sense of trepidation that followed Ratzenberger's accident - but my memory was of all at once becoming fearful; that the two cars, Senna's somehow in particular, seemed to be pushing their luck in their desperate chase; that something awful was near. And then at the start at the second lap after the safety car had gone away it happened. The TV footage we watched was onboard with Schumacher, the scenery at either side flashing past at great speed, with Senna's Williams that the Benetton chased a silhouetted, roaming spot ahead. But going through the fast notorious Tamburello turn that opened the lap - without much space on the outside before you encountered a wall - the spot of the car plunged off the right of the screen without explanation, almost like it was a fly wiped from the camera lens. After the Williams bounced off the wall and as a wreck came to rest all seemed an eery, incongruous silence and still, the sort that never fails to unsettle. The TV camera unflinchingly focussed on the car and driver; Senna's head was upright, not slumped as it had been in Ratzenberger's case, and I and all others stared intensely at the figure in the cockpit, willing, pleading with him to move, to wave a hand - something to confirm that he was OK. A few seconds later there was the tiniest movement of his head, which again I and everyone else pounced upon - but then nothing. The stillness and silence seemed to stretch on for an age. The TV cameras hung pitilessly over the scene, although the BBC to its credit cut instead to a still shot of the pit lane while dutifully Murray Walker did his best to keep us updated as Watkins and the circuit's medical team descended. But Walker's and everyone else's feeling of uselessness as we had little choice but to sit and wait was cutting. At the time it seemed to me an accident of considerable violence. But to hindsight it wasn't. Compared with Nelson Piquet's and Gerhard Berger's smashes at virtually the same point of the Imola course in previous years it later would look almost tepid. Indeed, the impact we were told not long afterwards was 'only' at 135mph, as Senna had been able to apply the brakes before hitting the wall. Some time after I would discover the fatality had, for want of a better word, been a freak; resultant of a piece of suspension detaching and penetrating his helmet through the visor, having an effect akin to a bullet shot from a gun. I don't recall watching the race when it re-started, and I can't recall what I did instead (I might have gone out on my bike). I also don't - strange though it may seem - recall any sort of desperate hanging for word of Senna's condition, nor even do I recall the precise point at which his death was confirmed. But I didn't need confirmation; somehow I knew pretty rapidly after the accident, indeed as he sat there in his car during the prolonged stretch of silence and still, what the outcome was to be. Perhaps it was related to the previous events of that dark weekend, wherein it seemed all of a sudden that no one could step out of a wrecked F1 car unscathed as they once did, in that it meant that this registered rather like a cruel crescendo. I found out later that plenty of others - within and without F1 - felt exactly the same way. But even if the realisation was quick, the acceptance and certainly the closure awaited much later. For me Senna's departure left a hole in the sport. Instinctively you would scan an F1 track for the iconic yellow helmet, blasting clear of the pack from pole if his machine allowed; heroic and unceasing battling against the odds if it didn't; intimidating rivals out of his imperious way. 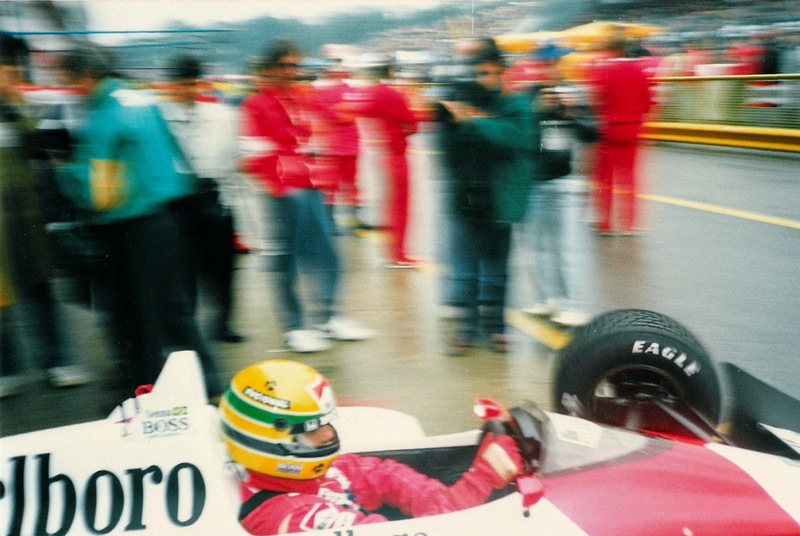 Instinctively you would look for the stunning car control and bravery when the rain came down; then there were the qualifying laps, wherein Senna's skills really amazed and stupefied, to the point that the starting grid could rarely be said to be set until Ayrton had his say. As John Watson noted, on such a single - fully committed - lap his car would dance on its very tiptoes, resembling raindrops bouncing off a road surface. And when on-track matters were done your ears would listen out for the beautiful tones of his voice, all elongated onngg sounds, the slow yet powerful delivery, all captivating gripping prose, usually poetic and frequently unafraid to speak truth unto power, always convinced and convincing. On the 1st of May of 1994 we had to face with exasperating suddenness that all of this was to be no more. It was a hole that gaped and hurt like an uncleansed sore. 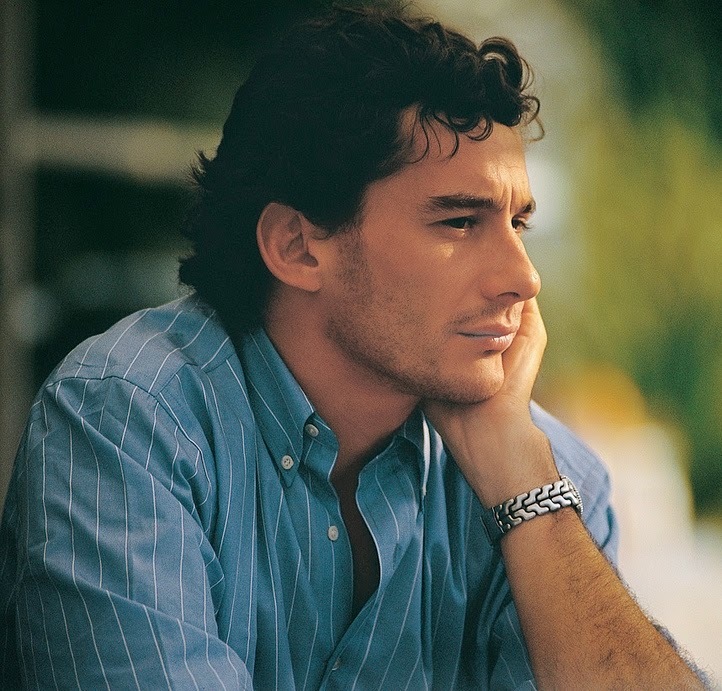 I drifted away from the sport for a long time after that day in Imola; to an extent Senna's departure felt a lot like the day the music died. F1 races without him had for me removed a lot of the tension and suspense; a lot of the point. Without wishing to sound callous I initially at least found it much harder to care about the rest. Plenty of races in the remainder of that campaign I have no recollection of watching at the time at all. It wasn't until 1996 that I started to make a point of watching all of the races again. Not until 1997 did my broader interest in F1 prevail and I became an obsessive a lot like before. And it's continued that way until today. But even now in my mind in F1 without Senna there remains a gap. Most of all things just seem a bit more normal; explainable. And - on the track and off it - that little bit less electrifying too. Sometimes with Ayrton Senna he would do things with a racing car that defied all explanation, to the point that for as long as he was in a race, no matter the obstacles he faced, you simply never could discount him. And for that, through all of our memories, Ayrton Senna da Silva remains truly immortal. Great post, very well described. It resembles much of my experience at the time. It was not until my 10th birthday that my interest in F1 first appeared. You and I must have about the same age (born Sep. 1979), but I wasn't that much into F1 until my father took me to Estoril in 1990 as a birthday present. And I must say that what really got me hooked into it was the sound of the engines, as well as the smells (burned rubber, fuel, oil, etc.) and all the cars. Despite Mansell winning the race, it was really Senna who caught my attention. In the years following, especially the 91 season (where I could name, by heart, all of the first 6 drivers in each race, right up until Spa), I followed almoust with religious fervour, until May 1st 1994. That day I was watching the race while in a restaurante with my family and some family friends. When I saw those images of him slightly tilting his head and then standing still again, I instantly knew the outcome. Especially because I saw the whole Ratzenberger situation live on TV, and the discussion that followed, and was well aware of the Barrichelo accident, before the race. Here in Portugal, because we had Lamy racing, F1 was a much discussed and followed subject, so that sense of doom was very well present in my state of mind at the time. Well, I guess in May 2nd my attention was drawn elsewhere, and football was the rebound subject, for a while. 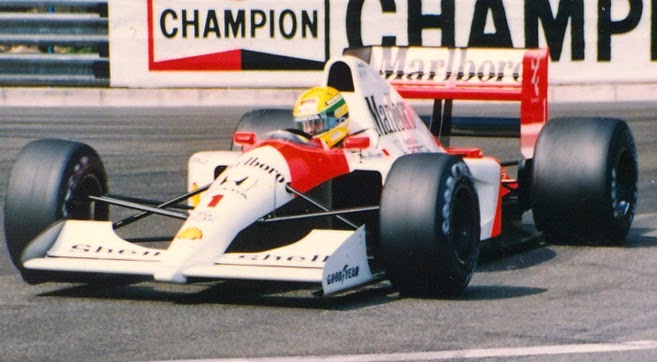 The rest of 1994 and 1995 I did not followed at all, from 1996 on my interest came back, but much more limited (the Senna void was very real), and it was not until 2007 that the passion came back in full force (Thank you Mr. Lewis Hamilton). Now I follow all of F1 with a much more mature interest. It has been a (re) acquired taste if you will, but at the same time in a much more mature way. It allows me to root for Hamilton or Alonso or any other (Ricciardo is doing very well in my eyes right now, as did Vettel in Monza 2008 or the whole 2010 season), without falling in the fanaticism field. For that I had Senna who remains as the ultimate F1 driver of all time. By the way, what happened to the GP Focus Podcast? Hi Ricardo. Thanks very much for sharing your thoughts. Thanks also for your kind words on the article, it's very much appreciated. It sounds like our experiences were pretty similar (yes, we are almost exactly the same age, I was born in August 1979!) in terms of following Senna at an early age and things never quite seeming the same without him. On the GPFocus podcast, I'm not sure - the chap that organises them has gone a bit quiet recently. It's on my to-do list to catch up with him so I can find our what the situation is, so hopefully I'll be able to update you all soon. Yes a very interesting read. I share all your sentiments of Ayrton Senna. He was my hero right from the start of the Silverstone GP in 1985, when he passed 3 cars before the first sweeper. I will always believe Ayrtons car was sabotaged. All upstart Schumacher had to do was push Ayrton faster and faster, until his car couldnt handle the G forces, and the poor done steering weld snapped, and we lost the best ever driver! I could handle Schumachers joy on the dias when he finally won the Imola GP. He showed NO remorse for Ayrtons death, and I hated him with avengance since that day. Why wouldnt he be happy, the only person that could beat him was dead! But he got his own karma on the snow. 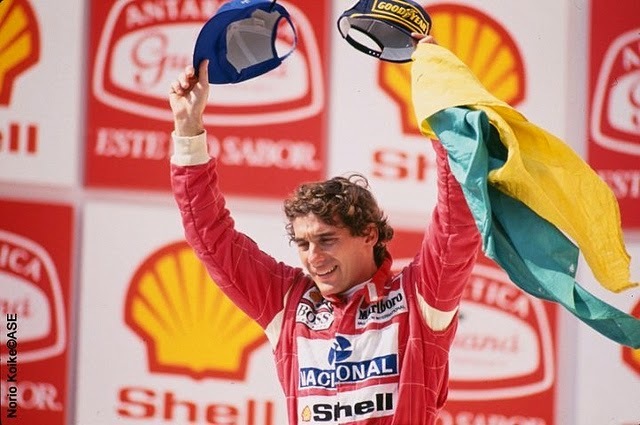 Ayrton Senna you were the best, and Formula One has NOT been the same without you. 23 years after your death I honoured you by getting Engaged to a Lady I am going to Marry in November. RIP Ayrton! !